A few years ago I watched a very interesting documentary about the discovery of the grave of Richard III in a car park in Leicester. This gave me the idea for a song about Richard III that I recorded and then I started to read as many books as possible about this Plantagenet King. This then helped to give me the inspiration to write and record enough songs for a whole album covering the life and times of Richard III. It was a fascinating project and I kept on getting so many new ideas for songs about his life that I then ended up recording three albums of songs dedicated to this King. What is it about his short reign that fascinates me and so many other people? Probably the historical mystery of the disappearance of the two sons of Edward IV is high up on the list. I suppose I should try to describe the sound of my albums. I would call it English folk rock with a medieval and psychedelic feel. Several people tell me that my singing reminds them of Ian Anderson of Jethro Tull which I take as a huge compliment. Having finished three albums about Richard III I still had some other songs that I had written about him and I decided to record another album which would include those songs and to write some other songs about the Wars of the Roses. 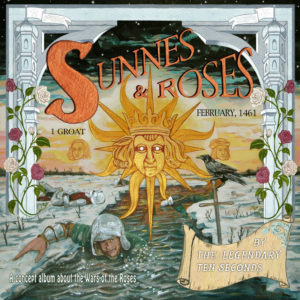 I decided to call this album Sunnes and Roses and I got the idea from a Ricardian blog on the internet which is titled by the same name. This album was finished and released on my Richard The Third Records label on 31st December 2016. I call it a new concept album about the Wars of the Roses by my band The Legendary Ten Seconds. For the time being the CDs of this album can only be purchased via the Richard III Society. A percentage of funds from the digital sales of this album will be donated to the scoliosis charity S.A.U.K. Warwick the Kingmaker. Richard III, Henry VII, Lord Hastings, Edward Earl of March, Lord Fitzwalter, Sir Andrew Trollope, Lord Bonville and Perkin Warbeck are just some of the people that are mentioned in the songs on the album. All the songs were written by myself except for Herald’s Lament which was written with the help of Sandra Heath Wilson and Middleham Castle on Christmas Eve which was written with the help of Frances Quinn. At one stage I had considered issuing a booklet with my first Ricardian album (Loyaulte me lie) but then decided that the cost of doing this would be too much. While I was recording the Sunnes and Roses album I reconsidered the booklet idea and then decided to write a book about my Richard III music project. Part of the reason for doing this was due to the large number of positive comments that I had received over the last few years from people in many different countries who have enjoyed listening to my songs about Richard III. 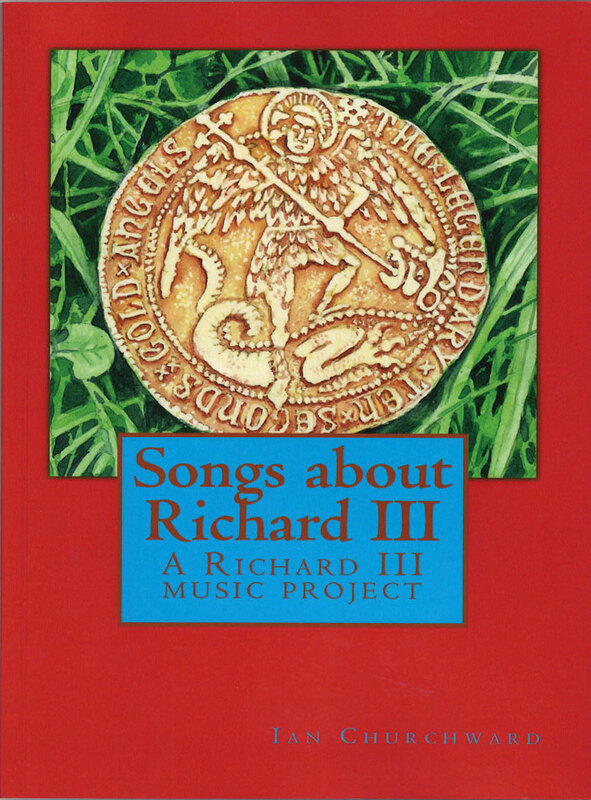 With the help of the authors Kathy Martin, Joanne Larner, Susan Lamb, Matthew Lewis and Sandra Heath Wilson I was able to finish writing my book and it was self published last year with the title of ‘Songs About Richard III’. So far I have been able to donate approximately £1000 to S.A.U.K. from the sale of my music about Richard III and I also intend to donate money to this charity from the sale of my book. I know that this isn’t a huge sum of money but I feel quite pleased about it since I have funded and promoted the project myself from my own limited resources. There are several talented musicians and singers that have helped me to record my songs and they are all mentioned in my book. A very special note of praise should go to my very good friend and member of The Legendary Ten Seconds band, Lord Zarquon (that’s his stage name), who has spent many hours every week since we recorded our first song about Richard III, helping me to finish the albums. A very interesting article about the special, diverse and often intriguing music of Ian Churchward and the Legendary Ten Seconds. Ever since I’ve discovered his/their music, it has become a staple in what I listen to. It’s just great stuff! !